With a few successful perch trips under our belts, it was time to bring along a friends father to test his luck at a chance at a jumbo. Another early rise, long walk and quick set up and we were fishing ten feet of water below the ice. 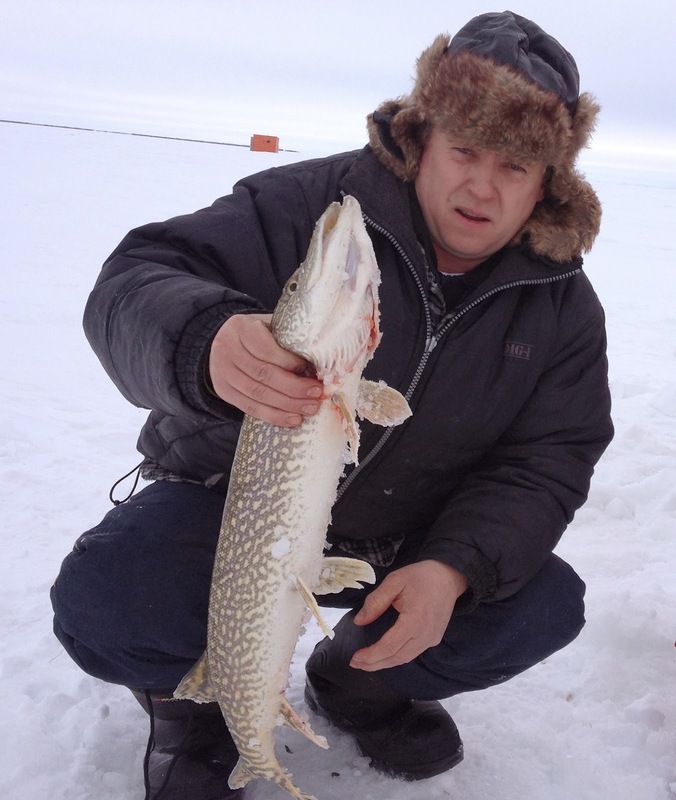 My friends father had fished for perch at a few different lakes in Manitoba over the last few years, as well as back in Russia many years ago. This wasn't anything new for him, but the sizes sure would be, if we could catch one. I had him using a small PK flutter spoon in a fire tiger pattern fishing just a few feet away in the shelter and right after I missed a tap on my darter something slammed the minnow tipped flutter spoon. I jumped up to pull the transducer out of the hole, hopefully avoiding an unnecessary lost fish and he said "No, no, not very big" in a charming Russian accent. I grabbed the transducer cable and hauled it up and just behind it up comes one tank of a fifteen inch perch. Excitement all around and high fives, before we could get a picture of the fish it was back down the hole to fight anther day. Tom was quite mad to say the least, he really wanted a picture of his dad with a huge perch. I felt bad as I had ranted on the drive up about my opinion in letting the big big ones go despite most others not doing so and felt that had contributed to a picture less release. "First big one must go to grow" he said. Contrary to the previous week, the dead stick was not on fire, It was still producing the odd eater though. We tried many different lures and colour combos as we normally do, I used it as an opportunity to try some that I hadn't tried on this lake yet and they all did surprisingly well. If a big mark showed up on the flasher and wasn't interested in my lure I would throw down a PK panic and see if that would do the trick and boy did it ever. 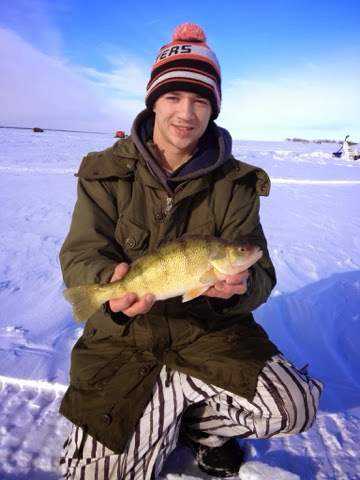 Tom was determined to not let his dad school him and was quite adamant in landing his first jumbo perch, it being his third trip to this lake. He was changing up lures often and landing a lot of eaters. Before lunch he hooked into and landed his first trophy perch on a Lindy rattlin flyer. It was a huge relief for him and a good morale boost for the day, father and son both icing a trophy perch, little did we know there were more to follow. After a lull in the action, and another missed tap on my darter, Toms dad got strike on his dead stick jig and minnow hung horizontal. Caught off guard, he set the hook and hauled up a nice 14.75 inch perch and right as we were about to take a picture it leaped out of his hands and dove right down the hole it came out of. We couldn't believe it and we named the practice "The Voth Release". A lot of chuckles were had as we continued to catch nice sized eaters on through the afternoon. With the day dragging on, the action slowing down and inevitable bad weather on the way we decided to give it twenty more minutes and then pack up, and boy was that worth it. Tom ended up landing his second trophy perch and his dad iced a nice sized pike to finish off the day. Our sled was a little heavier on the walk back, but lucky for me Tom and his dad pulled it while I dragged the shelter in its bag with broken straps.